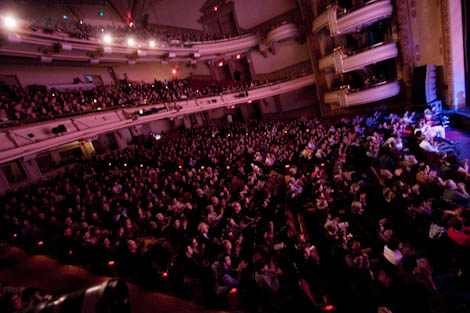 Last Thursday, Clogs played the Brooklyn Academy of Music with Bell Orchestre and the Brooklyn Philharmonic in a comeback concert (of sorts). 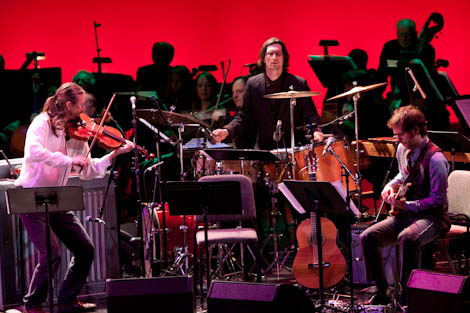 The band's emergence from relative hibernation was greeted with enthusiasm on various music websites, including The New York Times, whose critic (Jon Pareles) concluded that "there was no question that the classical and indie realms can share a border where music turns pensive, knotty and otherworldly." It's obviously been a while since the dude reeled through Lantern on his Walkman, but better he come to this conclusion late rather than never. Stereogum was also present, snapping photos and gushing over the appearance of Sufjan Stevens, Shara Worden (My Brightest Diamond), and Aaron Dessner (brother of Bryce, member of The National) for Clogs' performance of "We Were Here." To see more photographs from the event, head over to Brooklyn Vegan and Pitchfork. To see some photographs posted by us (half-witty commentary included! ), click on over to Flickr.